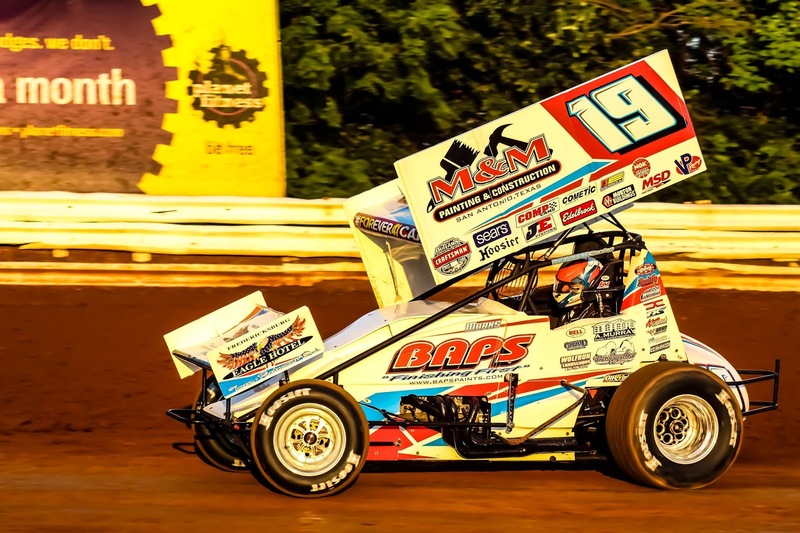 WEEDSPORT, NY – July 29, 2018 – Brent Marks led all 35 laps en route to his second career World of Outlaws Craftsman Sprint Car Series Feature at Weedsport Speedway. Despite Marks lapping up to eighth in the non-stop Feature, it was far from easy as he fended off Sheldon Haudenschild and Jacob Allen who completed the podium. Brent Marks won the Sears Craftsman Dash, earning the pole for the 35-lap event along with fellow Pennsylvania native Jacob Allen. Marks got the jump on the opening lap and paced the field down the backstretch as Allen fended off New York native Chuck Hebing, who had a 360ci engine under the hood, for second. Marks reached lapped traffic within five laps around the slicked off 3/8th oval. Allen, in search of his first career Outlaw victory, closed in on Marks through the middle of the racing surface with 10 laps complete. As lapped traffic intensified, Sheldon Haudenschild got around Hebing for third on Lap 12 and set his sights on the lead duo. Marks and Allen continued to negotiate traffic efficiently as Haudenschild attempted to close in. By Lap 20, Marks was held up behind a pair of lapped cars racing for position allowing Allen and Haudenschild to close in. Lap 23 had the Weedsport Speedway crowd on their feet, with Haudenschild pounding the cushion, Allen glued to the bottom and Marks trying to navigate traffic. Haudenschild got around Allen on Lap 24 on the cushion and chased Marks down the backstretch. Haudenschild ducked low in turn three and four, searching for a way by Marks, who stayed committed to the top. Marks powered his way around the Stenhouse Jr.-Marshall No.17 to remain out front. Marks continued to lead and remained aggressive through traffic. Sheldon remained within striking distance, but Marks was flawless through traffic, collecting his second career victory. “That was a lot of fun with the track being so technical, getting through turn one and two was so tricky. I can’t thank everyone who helps out with this team enough. Last time we were in Victory Lane it was just me and Jesse and now we’ve added Dallas. This is his first Outlaw win, so that’s pretty special for him,” a jubilated Marks said. “We’ve been working hard this year and passing all the cars we have this year, it really helps in lapped traffic. I can’t believe I’m a two-time World of Outlaws winner,” Marks added with excitement. "I kind of had to regroup after I hit the wall in turn one. This Stenhouse Jr.-Marshall team has worked hard and we’ve got a lot of big races coming up that we’re looking forward to,” the 2017 World of Outlaws Rookie of the Year added. Jacob Allen had high praise for his fellow statesman. “Brent was really good in traffic, he raced hard and ran good laps. This track is really slick and unique. I’m really happy with the night, but obviously I’m still looking for that first win,” Allen added with a smile. Brad Sweet finished fourth with David Gravel completing the top five. Donny Schatz crashed in Qualifying, forcing him to start last in his Heat Race. The nine-time Series Champion and Series Points Leader started 15th in the Feature and picked up KSE Hard Charger honors finishing sixth. Chuck Hebing finished an impressive seventh with his 360 motor and Ian Madsen was the last car on the lead lap in eighth. The World of Outlaws Craftsman Sprint Car Series returns to action next weekend with double Ironman 55 Features at Federated Auto Parts Raceway at I-55. Both Friday and Saturday at Pevely will pay $20,000 to win and $1000 just to take the Green. The Greatest Show on Dirt will return to the Empire State on October 6 to Fulton Speedway as a part of NAPA Super DIRT Week!